It’s a dedicated gadget for iPhone, and there are many iPhone users, so it’s very necessary for introducing some useful iPhone gadgets such as the mini iPhone microphone. As we know, iPhone doesn’t have a remarkable recording function due to using the open speaker on the back of iPhone. The mini microphone can resolve this problem. Just plug it into the earphones jack, and your iPhone will be able to record more clearer sounds. The mini microphone doesn’t need any additional battery, wire or application. The direction of the microphone can be changed freely through the multi-directional joint. 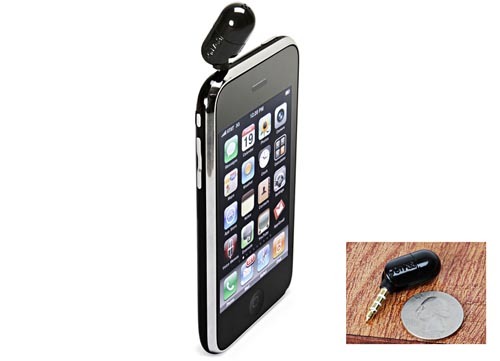 The mini iPhone microphone is priced at $12.99 USD. If you like recording with iPhone, the microphone should be useful for you. It’s available at ThinkGeek now.